I HAVEN’T HAD MUCH EXPERIENCE shopping for women’s clothing. And on those rare occasions when I’ve trotted off to buy a pair of slippers or a wallet, say, as a gift for my deserving wife, the mere fact of being in a women’s clothing store has made me deeply uncomfortable. Yet, I wanted to buy my wife a dress this anniversary. Actually, there was more to it than that. I wanted to be the kind of man of taste who knows enough about style and the female form to pull off buying a dress for his woman. I kept thinking about this meta-level of my little project. In college I took a literature course in which we learned about “the constructed self.” Other generations studied how authors use language to bring characters to life. We were asked to consider that all character–even the nonfictional you-and-me kind–is really a self-told tale of make-believe. Total poppycock, I know, but it got me thinking about how one becomes a certain type of person. How, if I deliberately set out to be that guy, he would eventually be, well, me. That guy–the one who comes home to his woman with a big wide gift box tied with one of those easy-to-remove giant ribbons only seen in the movies. She loves the dress, puts it on, it fits perfectly, and they hit the town. Cue the jazzy, good-time music. Besides, a dress seemed to be just the thing in this age of androgyny. It’s so “me-man, you-woman.” Okay, technically, as we’re all now thoroughly aware, a woman can give a woman a dress, as a “me-woman, you-woman” thing. And, for that matter, a man can give a man a dress, one or both of them being cross-dressers. But that’s nothing to do with the particular character I was determined to construct for myself. Which was hard enough. There I was in the store, trying to talk myself into making the purchase–making it with the easy confidence of a man of savoir-faire who knows what his woman wants–and feeling as unnatural as an actor at a cold reading, delivering his lines for the first time. Not only that, but I was the only customer in the place that weekday morning, and the mannequins, frankly, scared me. 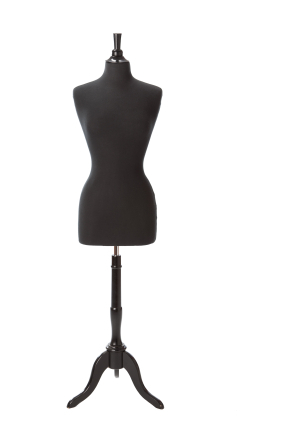 This is a little off-topic, but I actually suffer from a fear of mannequins dating back to childhood nightmares, in which they would appear dismembered and heaped in ghoulish piles. And they would never, ever blink. When I read The Professor’s House a few years ago, I couldn’t imagine how Godfrey St. Peter could stand to study in a room also occupied by his wife’s dress dummies. Anyway, there I was in the store, and the salesgirls exuded uncertainty when they saw me–sensing, I suspect, that my pose as a guy who knows how to buy a dress for his wife was fraudulent. Finally one of them asked if I needed help. I did, of course, but so much more than any salesgirl could provide. I said no thanks. Then it occurred to me to make a joke (“Hey, do you think one of these little strappy numbers would fit over my big shoulders?”). But, unsure whether the joke would confirm or undermine my cool-guy persona, I kept it to myself. I’ve neglected to mention one other reason I wanted to buy my wife a dress: simple necessity. There are three major gift-giving occasions every year (anniversary, birthday, Christmas), and I’ve known my wife for almost seven years. Inevitably, the question arises: How much jewelry can one woman wear? She also receives little necklaces and bracelets from her father, for whom jewelry has always been the gift of choice. At this point, her tiny jewel box is bulging. So there I was. I walked up to several dresses that seemed nice and tried to picture my wife wearing them. Afraid of looking like I knew too much about women’s clothing, I refrained from lifting any garment off the rack and appraising it mid-air like a regular shopper. Perhaps as a result, I passed up a brown one, then a pink one, without quite knowing why. I must have struck a particularly stiff and awkward figure, standing before the dresses, viewing them formally like art in a museum. But finally, I settled on one. Nice spring color, girlish without being immature, a cut and pattern that should be flattering. I said I’d take it. My anniversary is still a couple of days away. At a dinner party the other night, my wife excused herself from the table, and I used the opportunity to amuse our friends with a brief account of my shopping adventure. I intentionally made myself a figure of fun. Everyone laughed, but–I noted with great satisfaction–the women seemed impressed. Pretty suave, eh?